Not long after Brooke was diagnosed with autism, I joined our district’s Special Education parent Advisory Council. Mandated by the Mass Dept of Education, SEPACs are a great place for parents to start when seeking information and guidance from those a little further down the path, and to create opportunities for coalescing critical mass around particular issues to affect change when necessary. The woman who ran our SEPAC at the time had been at it for over a decade and was an incredible resource for anyone just joining the world of special education advocacy. At the same time, there was (and still is) also an autism-specific parents’ educational advocacy group in my town. Years before I came onto the scene, a small number of trailblazing parents of autistic children had come together to advocate for their children’s often-similar needs. Over time, as autism became more prevalent in our district, the autism specific group grew both in numbers and influence. While the autism group had less than a quarter of the membership of the larger group, its time and sway with the administration was nearly equal to that of the SEPAC. Since my daughter is autistic, I joined the smaller group and, eventually, their steering committee. And I saw what felt like a microcosm of what was going on in the world of disability advocacy overall. The autism group would often go about its business in a vacuum. For myriad reasons, including a strong desire to protect their children’s confidentiality, the group became increasingly segregated from the SEPAC, often seeking to influence policy without any collaboration with the greater disability community. At times, duplicated efforts and reinvented wheels were the least of our problems. Leaving kids behind who didn’t carry the same label as ours? Well, that was a little bigger. There were of course, parents who fought valiantly against the tide, and their efforts bore fruit. I will never forget one woman in particular, who will know who she is, running (metaphorically) like a headless chicken between the two groups trying desperately to keep them communicating. Ultimately, three of us took on the “official” roles of liaisons and my friend was able to rest in her nest. Disability-specific advocacy is necessary. It has a place, and a very important place, in the broader advocacy landscape. Autism in particular presents very different challenges than many other disabilities and, therefore, policies and procedures designed for the benefit of those with other types of differences – ie physical disabilities or cognitive impairments – are often not only useless for, but can actually have a negative effect, on those on the spectrum. So I don’t discount the need for a variety of different, specifically focused advocacy efforts. However, when they become islands working completely independently of one another without consultation, collaboration and communication, we waste our already scarce time and money on parallel efforts, dilute our voices, and, ultimately, squander opportunities to make real, significant, and lasting change. We also run the risk of becoming exactly what we are railing against “out there” – exclusionary. Periodically, I post something like the graphic below. Something that reminds my readers that Diary isn’t just about autism. That it’s about people. That it’s about respect. That it’s about making the world better for ALL of our children. After I posted something similar recently, a mom spoke up. Tina said she’d had enough. Enough rejection, enough judgement, enough of both her and her kid being unwelcome because they had the “wrong” label. It broke my heart. Because I can think of no crueller irony than those who have been dismissed dismissing others. Than those who are made to feel unwelcome creating or perpetuating, purposefully or not, an unwelcoming atmosphere. And when it’s not even those who share a condition doing it, but their parents? Well, then I just find it appalling. The truth is, I watch it happen every day online. I’ve caught my friends doing it. I’ve caught myself doing it. We’ve all seen Facebook and Twitter and God knows what else turn into the very worst versions of middle school cafeterias as fully grown adults shed all but the hurt adolescents that reside within — the ones who still feel the sting from not being welcome at the “cool” kids table so many years ago. The ones who never quite felt accepted by the crowd, whose insecurities never completely faded, then flared to new highs as their own children turned out to be different enough that they were forced to face down all of the old slights again in all new faces. But instead of saying, “No more!” we create new cool kids tables. We turn into the very people who hurt us so many years ago. The public inside jokes, the thinly veiled digs at those who haven’t made it into the inner circle, the blog posts meant only to incite the cliques rather than help our kids. They’re all part of a vain attempt to soothe old wounds, and I get it. I’ve done it. But what we end up with when we allow ourselves to fall into the trap of validation-by-proxy are moms like Tina. And kids like Tina’s kid who search and search for their table and are turned away, time and again, not by the kids they find sitting there, but by their parents. Autism advocacy is important, but it can’t happen in a vacuum. Once we start believing that we’re the only ones worthy of a seat at the table, we lose not only the power of numbers, not only our energy, but our perspective … and our humanity. Tina has a child with Fetal Alcohol Spectrum Disorder (FASD). The challenges that he faces are very similar to those of a child on the autism spectrum. Just like us, FASD families are struggling to be recognized — to find a voice within the vast confederacy of stakeholders who are all scrambling for help, for resources, for support and acceptance. Let’s welcome them to the table, shall we? And do our part to help them in their fight to be heard. It’s the way our country is run now, isn’t it? Government by special interest. One group asks for what it wants. Another group wants the opposite. A third wants something totally different. Each one totally self centered and deliberately or unconsciously ignoring the others. The problem – I suppose – is that interests are sometimes the same, and they sometimes diverge. Occasionally they are mutually exclusive. Sometimes – a lot of the time – they are just totally different. It’s like the car world where a service department for Peterbilt trucks, Verizon company fleet vehicles, and late model Kia cars all exist together. Sure, they all fix motor vehicles. Sure, they all fix cars in the same town, even on the same street. That’s about the extent of the commonality. The mechanics all have different skills. The tools are different. The customers are different. The fact that it’s all motor vehicle based is in the end not much of a bond. When there is one restaurant in the town, and the Peterbilt mechanics all sit together when they go there, is it because the Kia and Verizon mechanics excluded them, or because they sat with the guys they knew? So looking back at special ed parents and advocacy, togetherness and inclusion in this context are very situational things. Are they your friends until you both want that last $50,000 of unallocated funds? Sharing sounds fine except you both “need” it for different things that cost $50k and aren’t buyable in smaller quantity. Maybe you can all be friends as long as no one grabs the last chunk of money. As a perpetual outsider, my inclination would be to go my own way anyhow. And there I am, the guy who fixes Mercedes. I know there is a Peterbilt dealer up the street, and a Kia place, and a Verizon fleet service center. I don’t know any of the guys there, and it doesn’t really matter to me much either way. Sure, they all sit together, but I don’t really care now that were grown. I don’t know them. You can only do so much. John, thank you so much for the thoughtful comment. I’ve been missing our dialogues! While I totally agree that we are all attracted to those to whose stories we can relate, and the division is therefore somewhat natural, where it becomes a problem for me is when one of The Kia guys comes over and asks if he can sit with the Peterbilt guys and they say no. Especially when the mayor and the selectmen hang out with the Peterbilt guys and the guy at the Kia table can’t manage to be heard at town meetings. I would also say that while many factions of the disability advocacy movement do unfortunately act like businesses, we’re (hopefully) in this for very different reasons than those for which one would be in a business enterprise. I’d love to see us rely a lot more on each other, even sharing a common infrastructure when possible rather than spending so much time, energy, and money re-creating the proverbial wheel all over the place. I’d also like to see us at the very least consult with one another to ensure that, when possible, we are working toward change that will be the most broadly beneficial. I’m sorry to sound cynical, but my time serving on government committees has shown me that bringing everyone together results in very very slow forward progress. If there is any profess at all. Going my own way and forging ahead is really what helped me. To me, this just gets down to leadership. When someone makes the right moves and opens doors in creative ways…people follow. I think those who create divisions, who only speak to their own group: this happens, but there is a real hunger for new direction. Right now, those who create divisions have the loudest voices, they create the illusion that their POV is the only one. But there is a silent majority who want more positive, inclusive efforts…and they are just waiting for someone to lead the way. And there are people out there leading the way. I’ll give an example of a group that I think is doing innovative, world-changing work right now…there is a program for disabled students in California called ACAT (Ala Costa Adult Transition). The group includes teens with different challenges. The students are not seperated from one another, their differences are not treated like something that makes it impossible for them to learn and interact in groups. The staff of the program teach self-advocacy, neurodiversity, daily living skills, etc. They strive to make these kids feel like whole, complete, competent human beings. When I was a teen (in the early 90’s), these were the students that would have been hidden from everyone else…they had “special ed” trailers off to the side of the campus, and the mainstream classes never saw these students. The way we hide differences in schools is a travesty…and ACAT is empowering these very students, and connecting them with one another and their community. What I like is that they are doing this by simply presuming competence. That is their starting point, and again, they work with them as a group…all of these different kids, with a variety of challenges are working together, being treated as equals. If it’s okay to link to the group, I’ll link to their Facebook page below. It only seems like there are no answers when we listen to those who say it can’t be done. And in my experience, those who have the answers are too busy making a difference to stop and win debates on blogs and comment sections. Ultimately, it’s a choice. We can listen to what the wrong people say, or we can learn from what the right people do. The good news: the right people are out there, in the trenches, teaching us how to move forward. Look at their stories…but most of all? Look at the pictures. Look at these kids tackling the world, smiling, connecting with one another. The right people, the leaders, are out there. And in my experience, those who have the answers are too busy making a difference to stop and win debates on blogs and comment sections. you know how much i love this, right? of course you do. Mr. Robison says, “my inclination would be to go my own way”, and I forgot to add that this is great…I think you can offer insights, practical solutions to so many of these complicated issues, so I’m excited to see where that goes. It’s like I said, the people really making a difference are just out there, doing it, so “going it alone” can often be exactly the right move. John- I hear what you are saying and I have to admit that much of my journey with my son has been that fight, slugging it out with the schools, the insurance companies, government agencies trying to get a scrap of the scarce funding allocated for helping those in need of help. But I want our journey to be about more than that, which is why I read here at Diary. Perhaps I am naive but I don’t believe it has to be an either or situation any more. I can advocate strongly for my son individually and also recognize the common needs and support those as well. It means I am going to have to put a lot more time and thought into my positions. I’m going to have to be more open minded. I’m going to have to do more than if I focused on him alone but I think those things are benefits to me in the long run. sums it all up. thank you. Thank you Chelsea. I appreciate how much Jess goes out of her way to make that so. Love this Jess, so very true. Ah, the alphabet soup, I know it so well. So many face the same struggles and challenges, and celebrate the same small victories, regardless of what charts say, and sometimes when answers can’t even be found to be placed in charts. 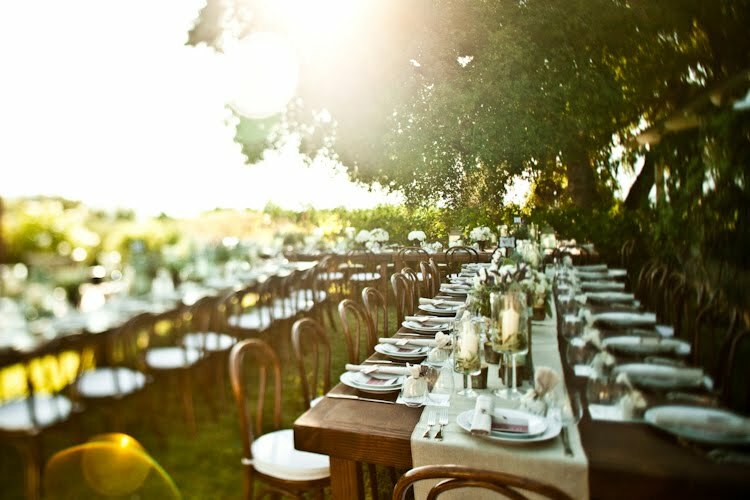 We all need a table, with others, to sit at. Spot on, thank you! I love that you’re talking about this. I think you hit the nail on the head when you talk about how insecurity leads to exclusion and insularity, though the insecurity I’m most familiar with is that of the “self-advocate,” rather than a parent advocate. But in general, when we come together with others for a group/cause, the kinds of people we choose to advocate with determines both the breadth of our goals, and the image of ourselves that we present when we advocate. Exclusivity, whether or not it seems more practical, or efficient, always boils down to the fear that including “others” could endanger the image of ourselves as deserving, worthwhile or special. At our worst, the more insecure we are about ourselves, the more likely we are to throw other groups under the bus in order to try and prove our own value. [It’s not hard to come up with examples of this off the top of my head: With extreme, Aspie/HFA-exceptionalism folks, it’s “Hey, we’re not like those sad, low-functioning people. We’re not stupid.” With some LD/ADHD groups, you get “Hey, we’re not like those boring, literal autistic people. We’re super creative and rebellious!” With some groups with physical disabilities, it’ll be like “Hey, just because I’m in a wheelchair doesn’t mean that I’m mentally challenged. My brain is just fine.”] Some scared part of us actually buys into the idea that, if we can just show people how different we are from those other, sad/scary/dumb/sick disabled people, we’ll be “safe.” Opening up our “table” to others, especially those who might not fit with that “safe” image of ourselves that we’ve been taught to maintain, is one of the most difficult, and I think most valuable, things any group/person can work on. And it isn’t just some abstract goal. Not abstract: It took three months of starting and then stopping, circling and panicking, for me to actually read through one piece on Julia Bascomb’s blog called “Diary of a Drooler.” When I finally got around to reading the whole thing, I just…cried. I knew that internal voice: the one whispering that as long as nobody knows how gross, nasty, and messy I really am, I should be okay. Because being “gross” means being not even human, being repulsive, being untouchable, like those other not-people. The only way I will ever be able feel safe is if I decide that the bad, “other” kind of person I’m so scared of being deserves to be safe as well. Mine is an extreme example of the insecurity you discussed, but I still think it’s relevant. We shouldn’t just let other people have a seat at the advocacy-table because it’s nice, or efficient. If you ask me, we should do it because support, recognition, and care aren’t commodities in a disability rights zero-sum game. Then there is the likes of “us”. We fit nowhere really. My son needs some support, much less that when he was younger. Why: because we worked so hard to help him. Little help medically or educationally. I am tired of fighting “the system”….. I have two life experiences to share, if I may. 1. My kids have Ehlers Danlos Syndrome. They have low muscle tone and require occupational therapy. They require this so that they don’t end up in a wheelchair later on in life (and given the probabilities of our having one of the more rare types of EDS, such therapy *may* also save their lives!). They are entitled to up to six funded sessions per year for life. My kids also have Autism. They have low muscle tone and require occupational therapy. They require this so that they can learn how to hold a pencil properly and run without looking “weird”. They are entitled to up to $12 000 worth of funded sessions up until their 7th birthday and up to 20 funded sessions after that until their 15th birthday, and another up to 6 funded sessions per year for life. They may also receive sessions through the state disability department in collaboration with the local school, depending on the funding of the local area (this is rare but I have seen it happen a few times). 2. 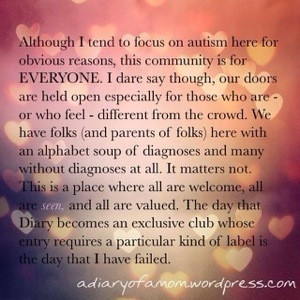 I have been “unwelcome” at every Autism parent group I have tried to join. I am polite and willing to help with anything I can. I listen. I care. I also talk about what it is like to have Autism. I make sure to be clear that I am ONLY talking for ME, not for anyone else, yet I still see the looks on their faces. I still read their words online that show their discomfort (or notice that I am simply ignored completely). Every single Autism parent group I have tried to be a part of has shunned me because I have Autism. We never ever leave high school. Just last Monday, I received an email that indicated my next door neighbours and management of our apartment complex are lying to my real estate agent about me. Instead of just coming to me and being honest, they are being bitchy behind my back. I’ve been in a panic since then, and even had to see my GP yesterday because I can’t eat and I can’t stop crying and I’m too scared to move or make a sound in case I break another rule that doesn’t exist until I break it… I’ve been put on Diazepam for a few days. I thought I left high school behind, but these women are in their forties/fifties? I don’t really buy into the whole “insecurity/fear” excuse. I get that it’s a “thing”, but it’s not an excuse. I’m insecure and fearful and I don’t behave like that. So it might be that the person is doing it because they are insecure and fearful, but they are also doing it because they just don’t care about anyone else. I think that that isn’t always a bad thing – we all need to be selfish sometimes. I also think that we can be selfish when we need to be, but we can be selfish in a way that doesn’t actually hurt others. My neighbour and management could have had a coffee and bitched about me for hours if they wanted to – they didn’t have to go that extra step and lie about me to my real estate agent. In Australia at the moment, we have a few divides in disability. Some are invisible – no one for instance cares that the rules for the disability pension are different if you are blind – you can earn as much as you want to and still receive the full pension. With the use of today’s tech, I know three people who work full time and make a lot of money (well above average wage), yet are entitled to the full pension. The Australian Disability Commissioner, is entitled to the full disability pension, even though he has one hell of a good full time job. It’s an old law that used to have its place but simply doesn’t any more. Though I guess if it wasn’t for the fact that strangers in the supermarket walk up to me and yell at me for being a bludger and only pretending to have a disability so I can sponge off good hard working people, maybe I wouldn’t care about such inconsistencies either. Others divides are more obvious. Right now there is a push to lower disability payments, and make them harder to receive at all. There is a push to get any person with a disability into work. Those of us who simply can not work, at all, are being left far far behind. The idea of lowering payments is to “encourage” people with disabilities into work – but no thought is given to those who can not and how the hell they are going to survive. I am already going to die far younger than I have to because I can not afford the preventative therapies I need. Things are going to get pretty dire when I can’t afford food or rent either! It is actually people with a disability who are heading the charge to adapt employment culture so that people with a disability who can work, are able to enter the system of employment with ease. They are the very ones giving the government the ammunition they need to leave the rest of us behind (“just because we have a disability does not mean we are useless – employ us now” type stuff). It seems that the whole world hates me because I have a disability. Or maybe it’s just that the whole world hates me. In any event, I am also over it. I am tired of asking – begging! – for help, and being told to piss off. I am tired to being the villain in everyone else’s internal play. I am just… done. My little man falls into the alphabet soup group and so far ASD is not part of the mix. But I have felt love and connection in every story here. I have a total fan crush on Jess and her family and I know I’m not the only one. ok, that was sort of awesome. ripples, ladies. ripples.